Lotus Just Juicy brings your furry friend savory stews right to their food dish! 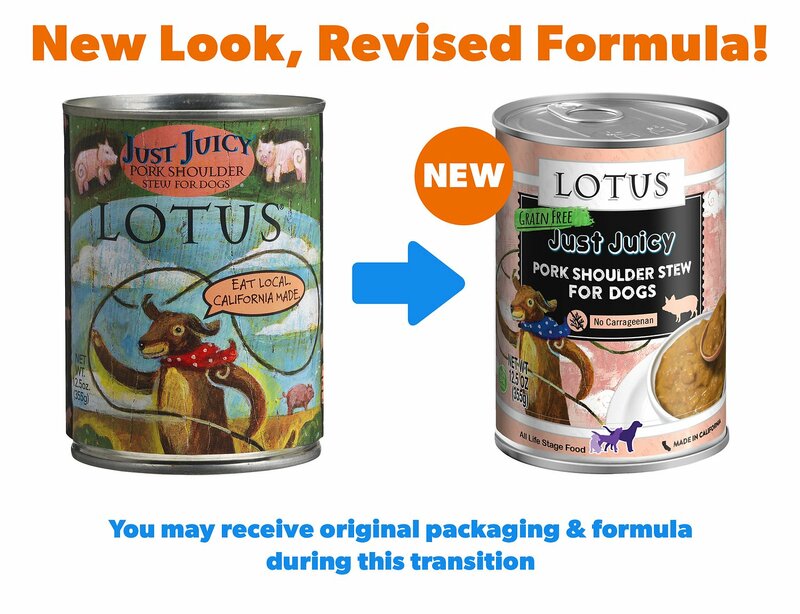 Both healthy and tasty, your dog won't be able to resist. Boneless Pork Shoulder, Pork Broth, Potato Starch, Calcium Lactate, Tomato Paste, Monosodium Phosphate, Agar Agar, Salt, Chicory, Potassium Chloride, Calcium Carbonate, Choline Chloride, Betaine, Zinc Proteinate, Iron Proteinate, Niacin, Vitamin E Supplement, Thiamine Mononitrate, Copper Proteinate, Manganese Proteinate, Sodium Selenite, Calcium Pantothenate, Vitamin A Supplement, Riboflavin, Pyridoxine Hydrochloride, Biotin, Vitamin B12 Supplement, Calcium Iodate, Vitamin D3 Supplement, Folic Acid. Reproduction: Provide increasing amounts of food during the latter half of gestation. The amount may be twice normal intake. Feed to consumption during lactation. Sophie is NOT a picky eater, but it was easy to see it was right for her. The best! Super picky doodle will eat this over and over again . . . Sawyer doesn't like veggies (this has none), doesn't like the same food back to back. So this has made a permanent spot in the rotation, he seems genuinely excited when it makes an appearance. The extra moisture/gravy I think is what puts it over the top. The whole can was watery with maybe two small chunks of meat. Th me stew means chunks of meat with gravy not all gravy. This was extremely soupy. My fur baby wouldn’t eat it at all. I’ve heard good things but unfortunately for my girl, it was not a favorite. 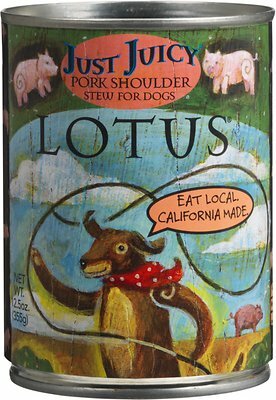 Our dog loves Lotus products. She prefers the Beef Shank formula to the Pork Shoulder one but both are great products and we only use as a kibble topper in the evenings; not as her primary meal. My puppy Murphy gives this one a thumbs up. He's picky and I have to rotate several varieties to keep him eating. This one has made the list. 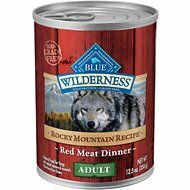 This dog food is amazing. 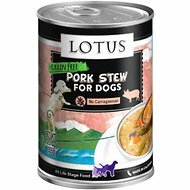 One of my dogs is a picky eater and loves this can dog food! I highly recommend if your dog has a sensitive stomach...which my dog does and does well with this brand. Another great dog food from Chewy. This is yet another great dog food we have gotten from Chewy Pet. It is very natural looking with an appealing smell and is of a consistency that makes it easy to mix with dry food. The dogs are crazy about it, going to each empty dish after everyone has eaten to check for possible leftovers.